The general consensus among pundits and reactionaries is that The Cradle of Liberty spoke loudly against the current atmosphere in Washington DC, including whatever incoherent monstrosity now stands as a Health Care Bill in the House. The election results, as abruptly surprising as they were, while always being a referendum on national politics by rule, is never as clear a national message as advertised. But, just as what you find funny does not make it comedy, does it fail to be comedy when you do not laugh. 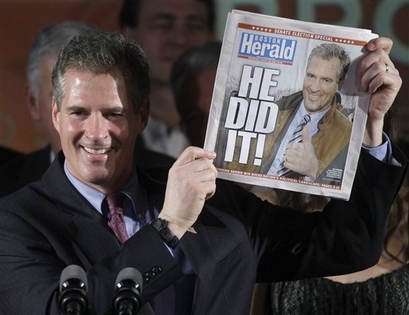 Before those crucial nine days unfolded you couldn’t have picked the victor, Scott Philip Brown, a little known and relatively benign anti-tax, fairly socially liberal Republican state senator out of a line-up. By around January 13, Brown trailed his opponent, the state’s attorney general, Martha Coakley by a respectable but hardly noteworthy 15 to 18 points. In a solidly Blue State boasting its own progressive health care system, where people for decades voted overwhelmingly for a Liberal Lion of dubious moral construct that also happened to be a particularly staunch proponent of a national health care system, the idea that a populist anti-Democrat uprising was a-comin’ is a myth. Many exit polls revealed that it was the stagnation and incompetence of government not National Health Care that drove the Brown vote. What a truck-driving nudist and a half-baked lawyer do in Beantown should have no bearing.